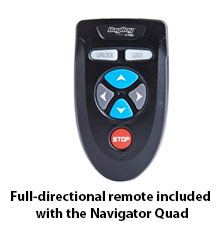 “ The [Navigator Quad] comes with a number of features including a [mobile device]/GPS stand and pedometer. Multiple speed options mean you can walk at your own pace,” summarized MyGolfSpy editors in their testing. “We are introducing a black base with blue accents as the newest color for the Navigator Quad,” said Gallagher. 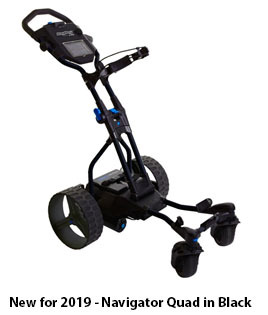 “The Navigator Quad is an outstanding electric cart option for the everyday golfer. 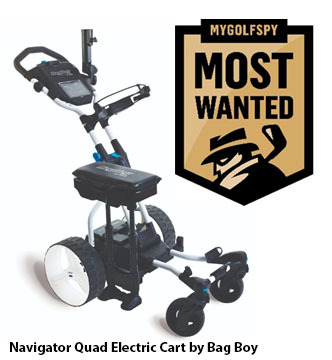 It has features that allow you to keep up with play and a seat for those times when things get slow,” said MyGolf Spy. A fully-directional remote control and patented gyroscope anti-deviation technology keeps the cart on track on any terrain. The Navigator Quad is available for $1,895.95 at retailers nationwide or here. Our mission is #ConsumerFirst. We are here to help educate and empower golfers. We want you to get the most out of your money, time and performance. That means providing you with equipment reviews you can trust, as well as honest reporting on the latest issues affecting the game today. #PowerToThePlayer For more information, please visit www.mygolfspy.com.